The Star has once again brought the poker tables back down a level, onto the main gaming floor. Due to massive renovations, The Star (formerly Star City) Poker Room had previously relocated to the quiet spot, up stairs in a dark dingy corner. But now after two years and the regular players prowling for the next fish to stop by their poker tables have something to work with. It’s same fish, who after luck-boxing their way to a healthy bankroll after winning big on roulette or blackjack or even the set-to-pay pokies would usually walk out the door, then hit the poker room, purely because they have no idea where it is. Stephen Ibrahim, the Star Poker manager, said a total of 20 tables would be available for use and a further 10 can be used in the sports bar when needed, during times like the Sydney Poker Championships and other big tournys. “It’s great to be back on the main gaming floor amid the day-to-day action of the casino. 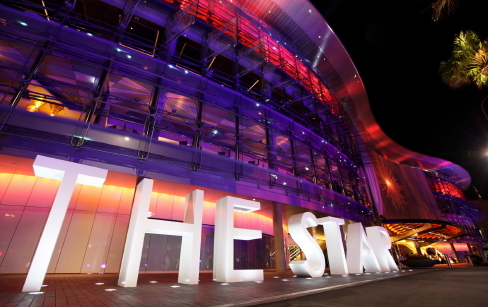 We’re confident that the visibility of having poker centre stage at The Star will help generate bigger numbers for both cash games and tournaments,” Stephen said. To add to the excitement of Poker returning to the main gaming floor once again, The Star have also decided to put on two new variations available for players. a 3/3 No Limit Hold’em with a buy-in $200-$300, and a high stakes 5/10/20 No Limit Hold’em with a buy-in $1000-$3000. Other Omaha and usual other regular games will continue as usual. Stay tuned for up coming tournaments due soon at The Star. The 2012 Sydney Poker Championships are literally just around the corner due for play from the 1-12 August. One thing is for certain, you may want to trek back down to The Star to get your cash game on, as the fish are starting to migrate back to the new look casino.